So you live in an apartment with a small spaced living room which can be a little tricky to handle at times. However, there are many ways to make your small apartment living room feels comfortable and inviting. Living in a small space is actually a preference to some people, with the right choice of furniture and style, you wouldn’t want to get out of the house! If you are on a budget, and let’s be honest: we all are, the first thing you have to know is if you want to splurge on an item, splurge on your sofa, because it takes up most of the space in your living room, so it has to be pretty to look at and comfortable. Now here comes the cheap decoration you can do: hanging pictures on your wall, add a vintage touch by going through your old stuff, diy when you can, buy items that only brings happiness, and last but not least; ask your relatives for unused yet decent stuff! Arranging the furniture you own in your living room is probably what makes it! 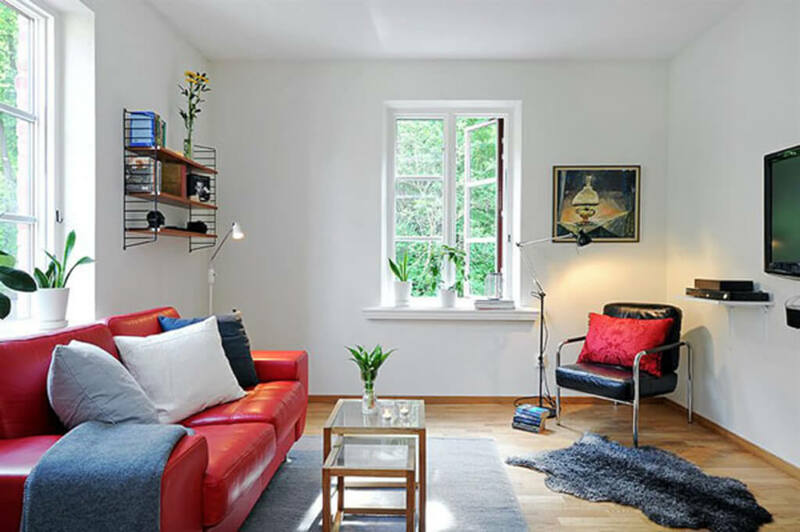 Here we offer two types of layout you can apply to your small apartment living room: the first layout you can try is to set a focal point, so that each and every furniture is directed that way, it could be your TV, a bookshelf, or a giant mirror. Second is to choose a layout that is symmetrical, this creates a sense of balance in your living room, say if you put a sofa on the left side of the room, then put two chairs on the right side of the room, so it creates the same weight to the eyes. Living in a small space forces you to think about your purchases, do not get overwhelmed. There are a few things you need to know before purchasing the furniture for your small apartment living room! Investing. Investing is so important for small spaces. Invest in multipurpose furniture, for example, a bookshelf that has hidden doors. Invest in long lasting furniture, make your small living room look expensive by bringing home only those that you will love for the long run. Lastly, invest on your sofa & a coffee table to complete the look of a polished small living room! Color plays a huge part in making a small space look breathable. The right choice of color can make a huge impact on bringing energy to the space. Choose colors that are soft yet bright to create a feeling of a wider space. A monochromatic or complimentary colors are perfect choices! As for the colors, it has been said that blue and gray have a way to trick the eye into seeing a space bigger that it actually is. Also, paint your trim the same color as your walls, it makes the ceiling appear taller! Avoid dark colors, they tend to make spaces look smaller than they are. Make the best out of your small apartment living room, because at the end of the day all you need is to come home. To come home to a space where both the mind and body can rest.